My lovely MIL got Husband and I each a Fitbit for Christmas. 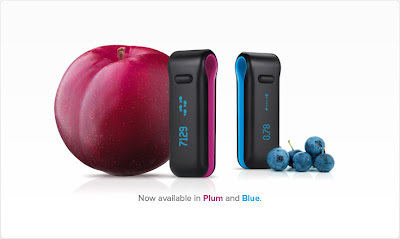 Mine is plum and Husband's is blue. 1) you can't create recipes on the food tracker. You can make meals for one person and include all the ingredients, but you can't put in a whole meal for more than one person and then say I ate a single serving of this whole recipe (which is something I LOVE about myfitnesspal.com). So I'll probably wind up manually adding in the amount of calories per meal based on what MFP calculates. 2) I wear mine in the center of my bra, between the cups, right against my sternum. It's comfortable at all times and completely discrete so I don't ever have to worry about it. I love that, but at the same time a) I'm worried that I'll forget to take it off when I do laundry, and b) since it has to charge on the charging dock, I have to remove it at some point and then I basically have to stay sedentary or my steps don't count. Not that's a huge thing (at all), I'm just saying. And that's it. A whole two (minor) things. Other than those, so far I love it. It keeps me motivated and encouraged to complete my steps. Although I haven't yet... Today it got me moving much more than yesterday to try to get 100%. Yesterday I only walked around my usual route with the dogs and did no more. Today I tried to be more active. BDR and I took Leia on a walk into town to go to the Pet Shop (which ended up being closed, ha) and then after he left for work I walked from my home to a main street I've never walked all the way to before for a total of 4.7 miles walked today (out of a goal of 5 miles). I'm happy with that. Part of me wants to go walk around the block to complete the whole 5 miles, but I think I'll wait and just push myself that much further tomorrow. I'm also excited about another gift my MIL gave us for Christmas: a membership to the local YMCA. It's located only 5-6 blocks away from us so I can walk to/from for a warm up/cool down, which is really exciting to me. I haven't ever had a membership to an actual gym before (only Tan & Tone) so this will be new to me, but I'm eager to get started! They have racquetball courts which probably shouldn't make me as giddy as it does. When I was younger I played racquetball one time at a gym in Lawton and absolutely loved it. It may have just been the novelty of it, but I'm hoping it's something I can still enjoy doing because it's a great workout. Not to mention all the other equipment they have there... I'm ready to start now! So things are looking up. I don't have my diet 100% (or even 95%) squared away, but I'm trying to take baby steps. I'm hoping that going into it one step at a time will help me create habits that stick. I am so ready and excited to see what 2012 has in store for my family and I! So many things to look forward to!! What are you looking the most forward to? Any resolutions you've set for yourself you want to attain? Any milestones or upcoming events that you are excited about?